Perhaps you haven’t cleaned your bike all triathlon season. Maybe you just went on a long ride and it rained on you. It might be the end of your season and you’re putting your bike away for a few months. Whatever the case, it’s time to clean your bike! Follow the 7 steps below and your bike will be clean in no time. Take care of the bike that takes care of you. Remember, a clean bike is a happy bike. Set the nozzle on the hose to a light spray and spray down the entire bicycle. You do not want the pressure of the water to be too powerful. It could remove grease in areas that will be difficult for you to replace. Tear the shirt into a few pieces and place in the bucket with a cap full of dish soap. Fill the bucket halfway with water and mix the water and soap around with the rags. Take one rag from the bucket and scrub the entire bike. Get the tires, frame, spokes, rims, hubs, drivetrain, and any other part of the bike that seems dirty. Check out this bicycle cleaning kit , it can make it easier to get to some of those hard to reach spots. Take the water hose again and spray your bike off one more time. This should remove the remaining grime that has been loosened up by the scrubbing. Take one of the remaining rags and dry the bicycle off. You can allow it to drip dry for a few minutes to make this easier. Now that your bicycle is clean and dry, it is time to re-lube the drivetrain and other moving parts. Take your bike lube and cover the entire chain. Drip a few drops on the cassette of the bicycle. Now drip a few drops on each side of your wheels were your skewers go through the hub. Finally, drip a few drops on the brake calipers where the center bolt passes through and connects to the frame. This blog post provides more specifics on cleaning a drivetrain. Now put your helmet on and take your bike for a little spin. Make sure you shift into every possible gear on your bike to spread out the lube. If you do not want to ride, just lift your rear wheel off the ground and shift the bicycle into every gear that way. Last but not least, wipe the chain and drivetrain down one more time with a clean, dry rag to remove excess lube. Maintaining your own bike can be fun, but it can also be confusing. What do I need? Are certain sizes needed? Where can I find these items? Below is a recommended home mechanic tool list for general maintenance of the average road or off-road bike. 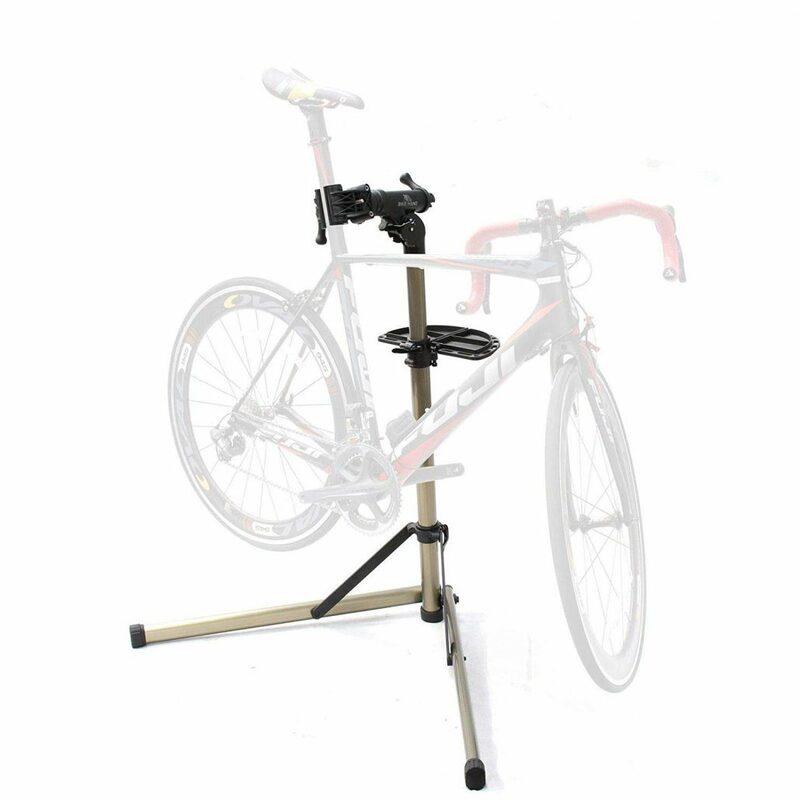 Bikehand Pro Mechanic Bicycle Repair Rack Stand. 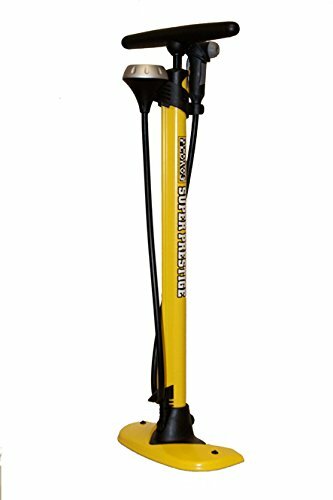 A floor pump is essential to your home mechanic tool list. There are several ways to purchase tools, including local bike shops like Mellow Johnny’s. Non-bicycle specific tools are usually available at hardware stores, automotive shops, tool stores, and some department stores. Always check that your brake pads are close enough to your wheel rims. Before you reposition them, check that the pads are not too worn down. Replace the pads if needed. If the pads are okay, then turn the cable adjustment knob counterclockwise until the desired pad-to-rim distance is achieved (1/8th of an inch is standard). The cable adjustment knob is located either where your brake cable enters your lever or on the brake caliper. Most modern braking systems have a quick-release mechanism that allows you to loosen the cable system without affecting your brakes effectiveness. This is the “slack” in the system needed to open the brake arms wide enough to get your wheel out. Some quick-releases are located on brake assemblies. Others are located on brake levers or elsewhere along the cable route. If you find too much “slack” in your braking system, check these quick-release mechanisms first to make sure they are engaged properly. You may need to clean or repair the brake levers if your brake quick-releases are connected properly but the levers function poorly. If you’re still having brake issues contact James Balentine of City Limit Cycles. You can schedule an appointment and he’ll make repairs at your home or office!